Published on February 16, 2010 by Wade Shepard Follow me on Twitter here. SOSUA, Dominican Republic- It is my impression that the internet was started as a way for people across the world to share information, content, and knowledge in a way in which other people could use and conglomerate it into something new and ever changing, ever connecting, ever growing. The internet is a way to give and take information. I take information from the internet, but I also give my fair share in return. I can’t tell you what would possess a person to do such a thing to a photo of an unsuspecting old guy in Turkey, nor could I tell you what the motivation was in this endeavor, but the photo of an old man that I took in Turkey was supplanted next to a giant heron none the less. And this serves as a good example of the how the internet should work: you give a little, you take a little. I am pretty sure that I never intend for the old man in this photo to placed in conversation with a heron, but I suppose these things are just bound to happen sooner or later. I am not going to go after the German with copyright infringement law suits, I am not going to send him emails and try to make him bow down to my mighty stance as a photographer. I am the man who possessed a finger mighty enough to take that photo, you must compensate me for it! No, this is using the internet the way that is was meant to be used. An American in Turkey takes a picture, he publishes it, then a German takes that photo and turns it into something else. And the baton is then passed on and on and on. If you don’t want people using your photos then don’t publish them on the internet. I receive emails regularly from people asking if they can use my photos. I give permission openly to individuals just so the source is cited, and if it is going online, and active link. If a commercial enterprise like a newspaper or magazine wants a photo then they have to pay — I am not going to give them free content just because they don’t want to pay their photographers anymore. I am a traveling writer, I have a daily travel column that I have been publishing for five years, I have put up at least 5,000 photos on the internet, more than 100 travel tips, answered 200 travel questions, put up 10,000 pages of travel information. I have flooded the internet with content and photos. And I hope it is being used. I travel the world looking for something to write about, something to photograph, and then I offer this information up to whoever can use it, do something with it, benefit from it — to whoever can build the tower higher, put the point on the steeple. This is the way cultures and societies and people can grow in the ether. 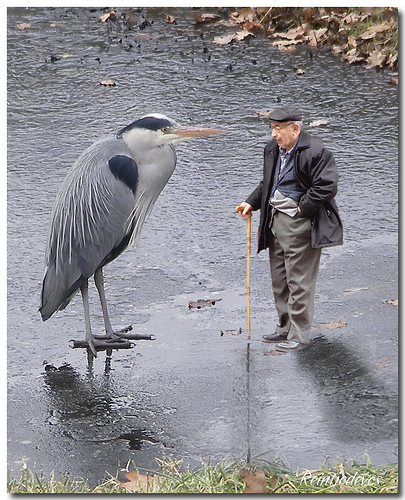 Even if this only means that a photo of one old man gets to be placed in conversation with a giant heron. Certainly sharing knowledge via the internet makes us all richer in a small way. To me that is the internet’s power, and that is to truly democratize the world’s information. I believe that the internet really does make us smarter people. For most webmasters, links are the currency of the internet. Though some “professional photographers” really don’t get it and they try to demand money for the use of their photos and they underestimate the true value of a link. Nobody needs to publish their work online, but if they do, it has the potential to be reused and reproduced all over the internet. Sharing information is good, that is why people created the internet to begin with. I also think that the internet makes people smarter — or at least think they are smarter haha. There is no dumber person than the one who thinks he knows about something . . . and the internet makes us all experts haha.